TLOS: The Magic Of Compound Interest. The King was a genius military leader, but this skill had come at the expense of his Math lessons. The King granted the student this reward and learned of his mistake months afterward... How did he not understand the power of compound interest? On the first day, the student would have earned 1 dollar. At the start of the 2nd month, 1+2; 3rd month: 1+2+4; 4th month, 1+2+4+8,... and so on. 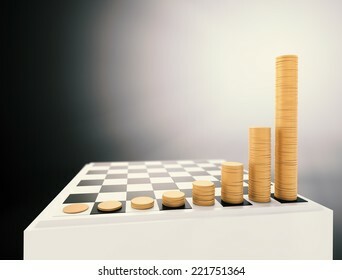 After 63 tiles had been filled the student will have earned 18,446,744,073,709,551,615 dollars, more than the entire kingdom. There was a new ruler now. This story shows the power of compound interest, money that is left on the table to grow, can become vast over time. It is no exaggeration when I say this has created immense wealth, it's a secret that the rich understand. Warren Buffet understands the power of compound interest, and he is currently worth 94 billion dollars because of it. But compound interest takes time, you won't see the results right away. It was only after 40 years of patience that Mr. Buffet started to see large increases to his wealth. So how does compound interest work? What is the magic formula that can make billionaires, and dethrone kings? That is for another lesson.